If you wish to get involved sign up with on the link above. You will also receive an event pack of Natco spices http://www.curryforchange.org.uk/natco and lots more. Every little helps….. 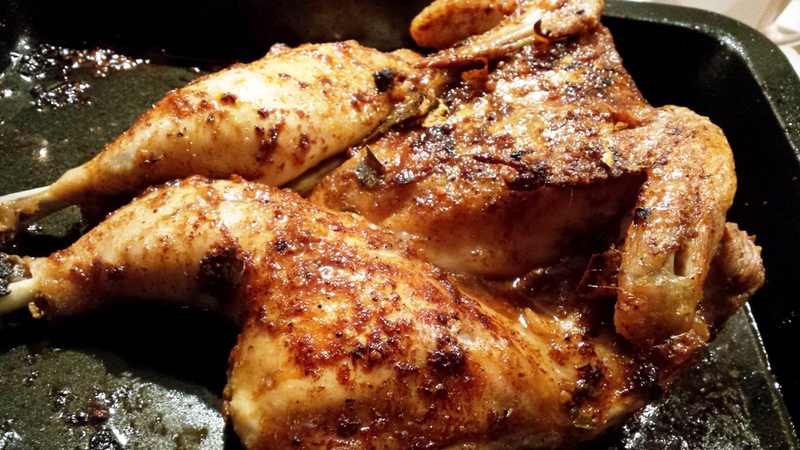 Here I have BBQ/Roast Chicken is on the menu, and I have chosen this recipe for few reasons. Firstly because it is one of the most eaten white meat in many household, secondly this recipe can be cooked in many ways – which you will see as you read through. This is what I call one recipe with several options to suit individual taste and use of different method of cooking depending on the cooking appliances/facilities you have available and your mood……as well as the weather and season you may be enjoying. Roast chicken is a very comforting meal, especially when it can be made in very little time. Here is one for you to try, it’s a flattened chicken whereby a whole chicken is cut in the middle into a butterfly shape. Nothing complicated here this can be done by using a pair of kitchen scissors, cut in the middle and casually flatten the chicken. The technique of Spatchcocking is great as it exposes the chicken surface area including the skin which is a real bonus of having more crispy chicken skins to enjoy. This way the cooking /roasting time is much quicker with very little effort. Even quicker if cooked on a BBQ, a whole chicken cooked to perfection on the grill outside, without any hassle. 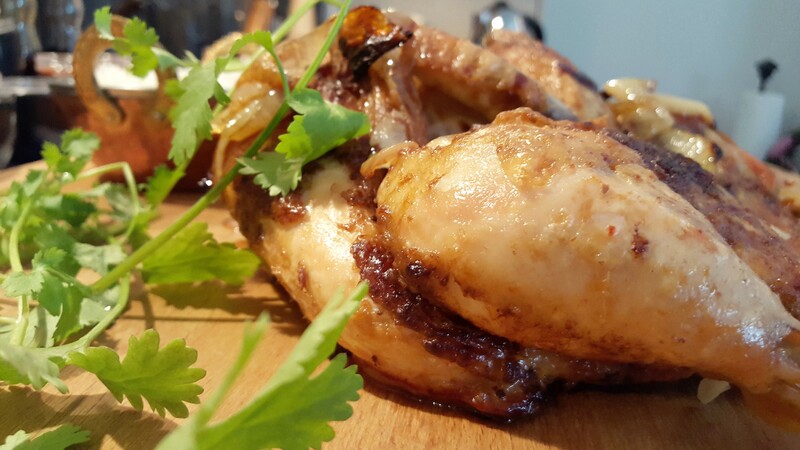 If time allows you can leave the marinating chicken in the fridge overnight or even a few hours before, making a much tender and well flavoured roast chicken. 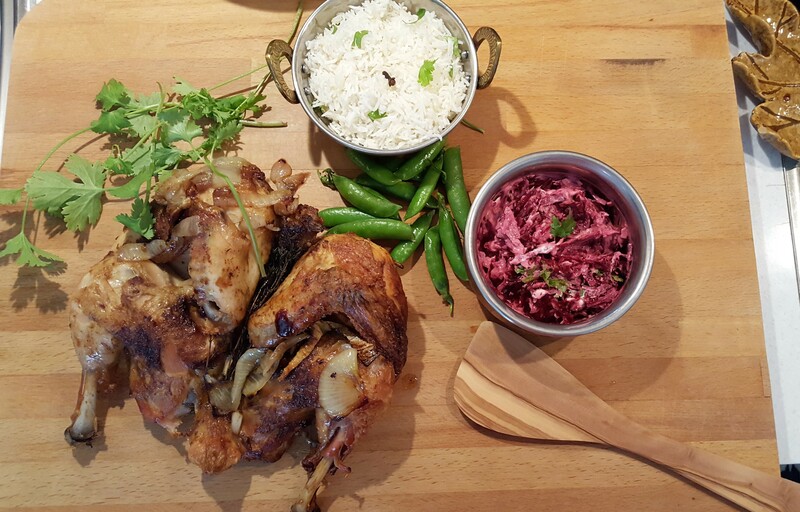 While cooking a whole chicken isn’t always practical, cooking chicken legs is a definitely easy option perfect for a quicker roast dinner. So here by using the same recipe, you can use make this dish with large chicken portions. NB: Please note five spices is a lovely aromatic ingredient as its name it contains five spices and must be used sparingly for a good balance of flavour – like most spices it will l keep for a long time if kept in an sealed jar. A little tip, using your finger gently run under the chicken skin in such a way to separate the skin from the chicken. 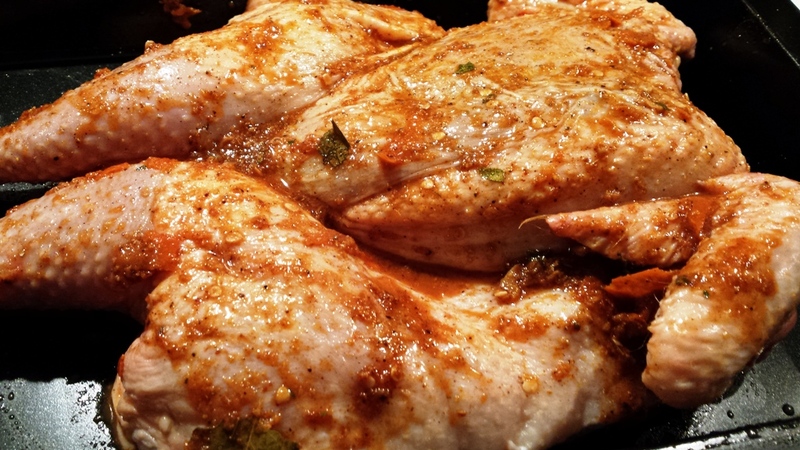 In doing this I like to rub the spice mix in this cavity rather than rubbing the spices all over the skin surface – this gives the chicken a more flavoursome taste without burning the spices leaving you with crispy spicy chicken skin. Transfer chicken to a carving board, and leave to rest 10 minutes. Cut chicken into portions, and serve with roasted vegetable. Served here with beetroot Raita and coriander flavoured rice.